An American citizen was shot and killed Tuesday in Saudi Arabia, according to a U.S. Embassy official. "We can confirm that an American has been killed in Riyadh," a U.S. Embassy official told The Associated Press on condition of anonymity. He provided no further details. Another diplomat in Riyadh, also speaking on condition of anonymity, said the victim was a man and that he was shot and killed in the Khaleej neighborhood of eastern Riyadh. Saudi security officials would not immediately comment. State Department sources tell CBS News Reporter Charles Wolfson that the man, an employee of the Vinnell Corporation, was getting out of his car when he was shot near his home in the Saudi capital. The Vinnell Corporation has a contract to train the Saudi National Guard. A Vinnell Corporation spokesman in northern Virginia, Kevin O'Melia, confirmed one of its employees was shot and killed. He said the company was trying to contact the family of the man who was killed. Neither the State Department nor Vinnell would give the name of the man who was killed. While the motive for the shooting was unknown, it was the latest act of violence toward Westerners in the Arab kingdom. In an opinion piece that appeared earlier this month in the Saudi paper Al-Youm, Saudi Arabia's ambassador to the United States said Saudis must recognize they are in a war against the militants. Winning required "general mobilization, intellectually, technically, privately, publicly, media wise and culturally," Prince Bandar bin Sultan said, adding he was concerned Saudis had not yet made the necessary commitment. A shooting Sunday in the Saudi capital killed Simon Cumbers, 36, and injured BBC security correspondent Frank Gardner, 42, according to the BBC. Two weeks ago, 22 people, most of them foreigners, were killed in a shooting rampage and hostage-taking in the eastern Saudi oil hub of Khobar. Saudi security forces captured one of the four attackers in the May 29 assault and are still looking for the other three. 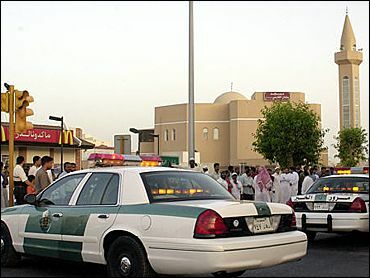 On May 22, a German chef was shot and killed outside a bank in Riyadh. The assailants remain at large. On May 1, a terrorist attack targeted the offices of an American energy company in the western city of Yanbu, killing six Westerners and a Saudi. An Internet statement bearing the name of al Qaeda warned Monday that Western airlines will be targeted for terrorist attacks and told Muslims to stay away from Westerners. The British Foreign Office has advised Britons against all nonessential travel to Saudi Arabia. The United States has gone further, urging all of its citizens to leave the kingdom — a move criticized by Saudi officials.